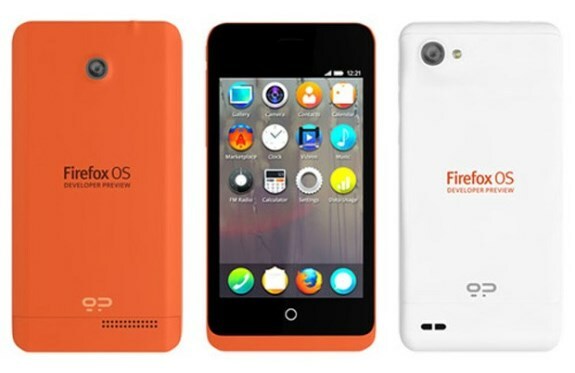 Engadget noticed that Mozilla has prepared a Developer Preview smartphone with the company's future Firefox OS. It's a pretty basic phone with a 3.5" HVGA touchscreen, a 1GHz Snapdragon S1 processor, 512MB RAM, 4GB storage, microSD memory card slot, WiFi, 2G/3G, a 3MP camera and a 1580mAh battery. It's unknown how much this preview phone will cost, but the first units are expected to ship in February. These phones are exclusively for developers though, Mozilla has no plans to launch own hardware when Firefox OS is finished. There also appears to be a more powerful version of the phone, Engadget found the details of this model at Geeksphone, the company that's building the Firefox OS developer models. While not mentioned directly in the Mozilla Hacks blog post, when you head over to the Geeksphone website -- the company building the developer models -- there is a more powerful variant on show called the Peak. It's the white handset pictured above, and has a 4.3-inch qHD screen, an 8-megapixel back-facing camera (with flash) and a 2-megapixel shooter round the front. The storage, RAM and connectivity specs are the same as the smaller Keon, but the Peak has a dual-core 1.2GHz Snapdragon S4 CPU and larger 1800mAh battery. We don't know why Mozilla would omit this device from the announcement, but we'll get back to you when we find out.